Caregiverlist’s Practice Certified Nursing Aide Test is presented by HEADMASTER (a division of D & S Diversified Technologies) a provider of quality, innovative, customized testing, certification, and registry solutions since 1988. As a leader in state certification testing, Headmaster implements all of the necessary testing standards to be chosen as a state administrator of nursing aide exams and other health care industry certification tests. The standards include content expert review panels, mandated training requirements based on curriculums established by each state and consistent updates to test banks. Share your score with potential employers, if you wish. (The information is 100% confidential – for your eyes only – you may share your test results with anyone you choose, Caregiverlist will only provide the Practice Nursing Aide test results to you). The nursing aide practice test provides you with questions that may be adaptable to each state’s exam. By taking the test, you should be able to refresh your caregiving knowledge. You may learn more about nursing aide skills, certification requirements and find nursing aide schools in your area on our Caregiver Career Center. Some senior care companies require completion of their own exams as part of the caregiver hiring process – both written and skills exams for caregivers. Caregiverlist’s practice test, presented by Headmaster assists you to develop your knowledge as a senior caregiver. You may apply for a caregiving position with professional senior care companies in your area by submitting our job application. Refer-a-Friend for a Chance to Win Prizes! Simply provide us with your friend's name and email address and you will be entered into a monthly and weekly giveaway. 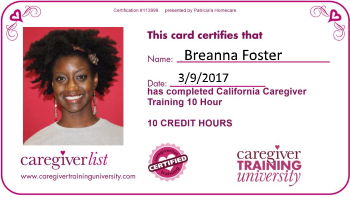 Weekly Winners: A Caregiverlist t-shirt, lapel pin and a 8-hour online caregiver training program as a member of the Professional Association of Caregivers.